Training for the Yorkshire 3 Peaks was stepped up a notch this week. Ok I lie...proper training started this week rather than just thinking about it! A 3.6k run around my village. Adam came with me in his pushchair. It is becoming too dark to run before everyone is up now so I am venturing into the village when people can actually see me - not a pretty sight. When I got home I was a sweaty mess any way so decided to do my Just Dance Wii workout before a shower. I managed 45 minutes - not bad with a toddler attached to my leg. Luckily, Adam is a bit of a mover and loves to dance. In the afternoon we had Toddler Tiny Talk - a work out in itself! I started the morning with another 45 minute session on Just Dance Wii. Mum persuaded me to do a 'hill training' walk at Gorleston. We call it a 'hill training' walk because there are NO hills around Norfolk but there are cliffs. So with two pushchairs (my 14 month old niece too) we go up and down each pathway along the coast - there are 5 up hill slopes and 5 down hill. It was very muggy! The walk is approximately 4.6km - its hard to work out will all the slopes! In the afternoon I had an unplanned walk home from my Mums house - another 2.7k walk up hill! No training today - although an hour session of Tumble Tots with Adam is yet another work out. When will my son learn to walk rather than run everywhere?! Mum suggested another 'hill training' walk at Gorleston - especially as it was less muggy. So that was another 4.6k completed and that evening I did another 45 minute Just Dance Wii session - much easier when Adam is asleep! After Adam's Swimming lesson and lunch we ventured back to Gorleston. Instead of challenging myself on the cliff hills I opted for a gentle walk along the promenade - and managed to avoid the ice cream shop! Without the slopes the walk becomes 4k. Adam loves spotting dogs along the walk and had a new wind mill to keep him occupied. As a family we went to the University of East Anglia's 50th Anniversary Festival. My Grandad built it 50 years ago so I wanted to show Adam what his Great-Grandad helped to create. Chris and I did our degrees there and both completed our PGCE Teacher Training. A trip to the UEA would not be complete without a walk around the lake. We managed a 4.6k walk - not bad considering most of it was chasing Adam around! 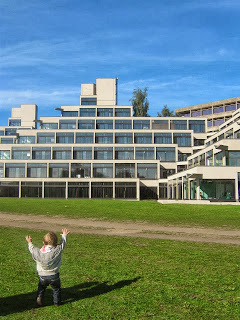 I had some time to fill on Sunday afternoon so decided to walk around UEA again. As my husband wasn't with us we managed to walk further and for longer! We managed 6.3k before having to head back. So in my first proper week of training I have completed 135 minutes on Just Dance Wii and 30.4k of walking. Not bad for the first week.